Progressive and easy to use scoring and Club Admin. New custom movements implemented with ability to automatically generate web, bowman and pivot movements. This will NOT generate a rover web where there are an odd number of tables and odd number of boardsets. It is important for the user to use the Validate Movement button before exiting the movement, and delete any bad movements created. Tournament Groups now divide more evenly when choosing Rating points (there was a small issue at the boundary values and players were assigned to the higher rated group when on the boundary. Though this could easily be changed manually users may have left these in ignorance). Handicaps screen has changed significantly for session handicaps. 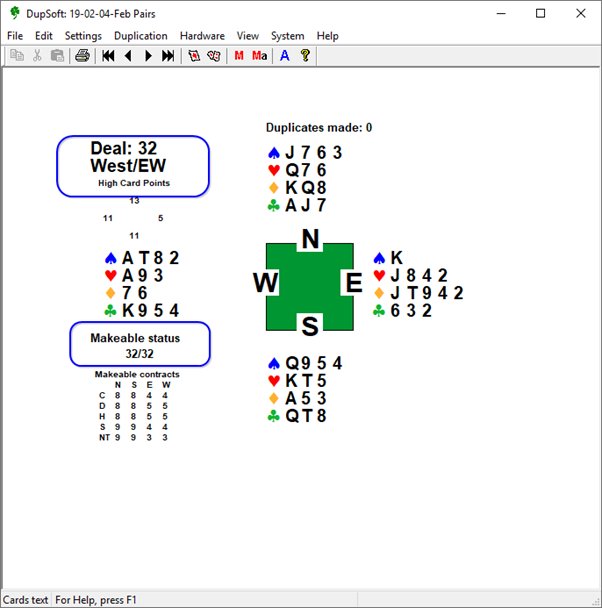 Starting pairs are shown and any pair where one or both players do not have a handicap are highlighted. Also Handicap button is now RED if there are players with no handicap assigned, and Grey if all the players have handicaps assigned. Section screen for pairs has “Edit Received Data” button to allow editing of results after upload. This is for expert users only, but allows contract and pair numbers to be changed when going to the web. If pair numbers are changed in the Board Scores then this will allow a match for XML to the web. Special ladders can now be sent to the web. This means that cross-competition laddres can be run with results going to the web. There is a button to delete all entries. This is sometimes useful if the entries have been imported into the wrong event. Ladders: “Force Qualify List” in the ladders screen will now add pairs and allocated scored to the session selected in the right panel. There was a bug where the score was only added to the final session and not the appropriate session. 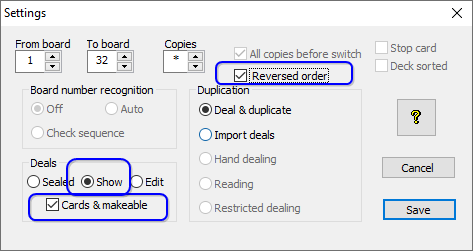 This option allows the user to add a pair to a ladder after being eliminated from a higher event or to put in a “double substitute” if that is allowed. Restore function now allows for the global change of the restore folder. This makes it a lot easier to restore to another machine for recovery or testing purposes. Fix problem with 2 sections in Multiple Teams not loading names. Fix problem with 2 sections in Multiple Teams not producing distinct result sheets - (new system report). Change Yes/No button when updating NZB player list and added Yes/No button to exit option. The old Yes/No button created a focus problem where the main ribbon bar was always on top. Teams setup now does NOT show the table number in the draw grid if "Use Team No for Table" is ticked. This is because the "Table No" was completely irrelevant and confusing. If using "Team number for table", then the team number will give the table at which the NS pair for that team are seated. HAVE THE PLAYERS MOVE THE BOARDSETS DOWN 1 TABLE WHEN THE PLAYERS MOVE UP 1 TABLE BEFORE THE FIRST HALF MATCH. HAVE THE PLAYERS MOVE THE BOARDSETS DOWN 1 TABLE WHEN THE PLAYERS MOVE UP 1 TABLE BEFORE THE SECOND HALF MATCH. 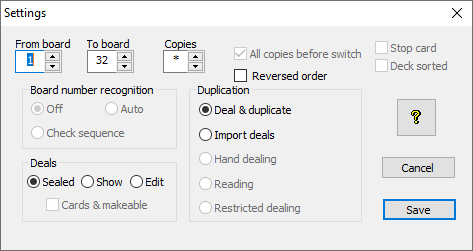 When running Teams, the printout in Team/Pair order is now the default. View Teams and Print All Teams options now work on reports so are correct for trifecta matches as well as standard head-to-head matches. New report added. This timer runs locally and does NOT need any internet connection. This is the manual distributed with NZ Scorer version 18. It is possible that there are some features in Scorer which have been inadvertently omitted from the manual. Swiss Pairs - either Datum OR XIMP will now recommend a VP scale to use. See the link below for the reason why. Handicaps have now been merged so the "Manual Handicaps" are stored in teh database and will not chenge unless the user chooses to use the "Calculate Handicap" button or edits the handicaps manually. These handicaps do not disappear at the end of the year. The rationale behind "The Neuberg Formula" by Max Bavin, Chief Tournament Director, EBU. VP Theory for XIMP and Butler scoring.